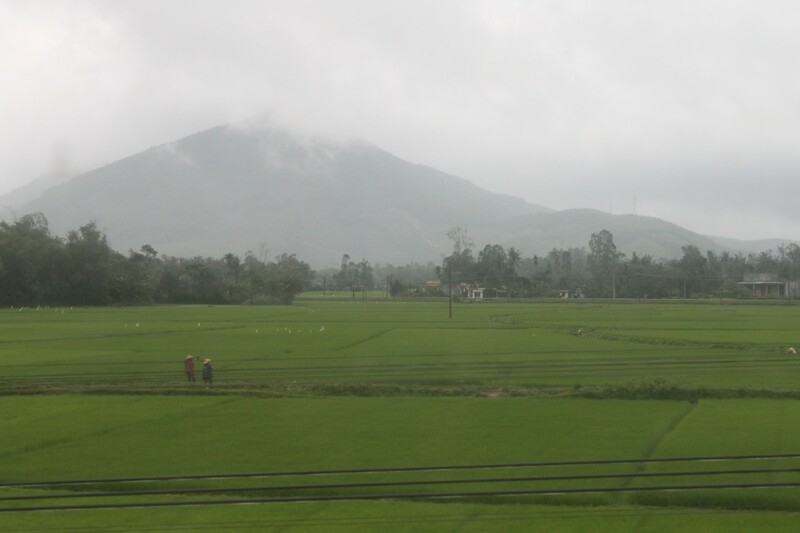 The Reunification Express (now more commonly referred to as the “North-South Railway” outside of the tourist brochures) runs from Saigon to Hanoi – spanning 1,000 miles of beautiful pastureland, countryside and hilltops. The railway was constructed in the thirties by French colonists, split in 1954 following the Geneva accords and remained as two separate rail systems until the end of the Vietnam war. In 1975 the two lines reunited and within a year the old route was put back into operation. In order to book your tickets for this train you have to physically go to the station as there is no online ticket ordering service in operation yet. As the sleeper compartments usually get booked up a couple of days in advance, it can be a bit difficult to spontaneously travel onward (though there is usually room in the hard sleeper section which has as many as four bunks to a wall)! 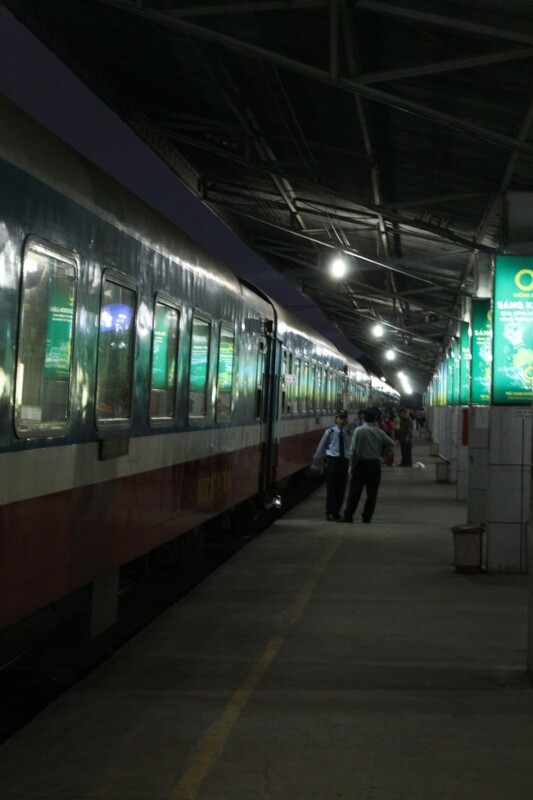 A slightly easier but more expensive way of going about booking is to go through an agency such as the efficient but expensive Vietnam Impressive (there are however many hotels and guesthouses that now offer train booking services and we found them to be cheaper). After our visa debacle at the Chinese embassy, we managed to find ourselves sleeper train tickets on the evening train out of Ho Chi Minh the next day. It was strange to think of this as the first train link in a continuous chain of connecting tracks that would eventually take us all the way back to London. We were shown to our carriage by the attendant (each carriage has one) and after we tried to thank him in our broken Vietnamese he smiled before rushing back to his post at the carriage door. 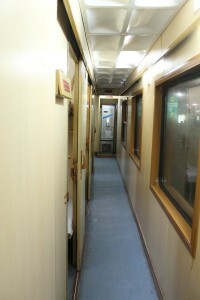 The interior of the cabins is basic but comfortable (and unlike the ‘plusher’ Chinese trains there were no television screens and sound systems so books and packs of cards came in very useful). The bottom bunks nearly always get booked up first as they are the most convenient during the day time, doubling up as basic sofas, having access to the table in the centre and enjoying the best views. As we had booked fairly late in the game for all of our train rides through Vietnam, we were on the top bunks both times but as the train from Ho Chi Minh to Danang and from Hue to Hanoi are both basically night trains, this wasn’t a problem. 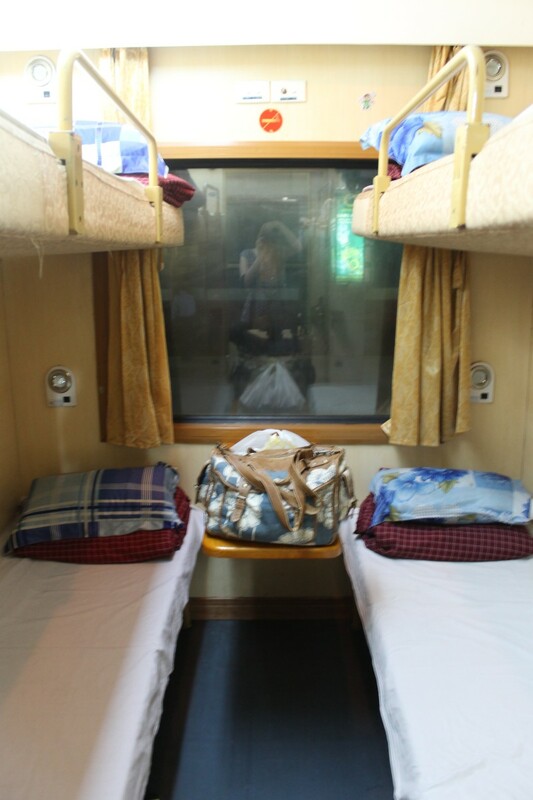 This was our first introduction to the standard 4-berth sleeper carriage (most of them built by German companies) which are used on many routes through Vietnam, China, Mongolia and Eastern Europe. Each one may have differing degrees of comfort but the layout is always the same and was to become very familiar over the coming months. 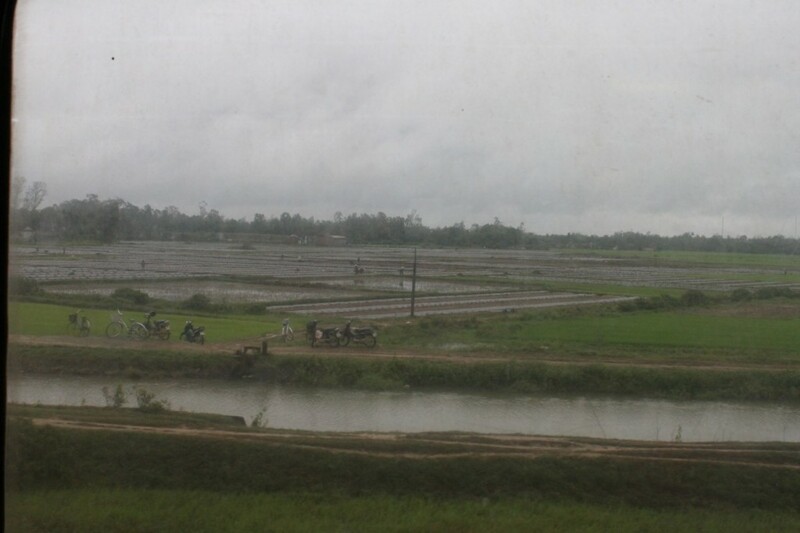 The train is a really fantastic way to travel as it offers a chance to bond with both locals and fellow travellers. Our first cabin companions were a brother and sister from Australia who had come to Vietnam on a spontaneous holiday with a view to getting some wardrobe items made up in Hoi An. We spent the evening playing cards and swapping travel stories before trying some local beer to help us get to bed. It was hot inside the cabin with our air vent missing a few nuts and bolts but the night passed quickly and as morning broke we were able to see beautiful pastures and rolling hills through the scratched window pane. Our second lot of fellow cabin occupants were a Vietnamese couple who were travelling with a large number of other family members, all dotted amongst the other carriages. There was a celebratory atmosphere as they began to unpack steaming flasks of tea and pots of noodles to share amongst themselves. The women started to gather in one carriage while the men congregated on chairs by the sink area, both parties soon deep in conversation and laughter. One of the women helped us map out the exact train route on a Palin-esque blow-up globe that we a had brought along as an illustrative tool to help explain our journey. Although there was a language barrier between us, we really appreciated being privy to what was essentially a family gathering taking place on a train and they were very generous with their delicious home made dishes, which made a diverting alternative from our own carry-on dinner of crackers and peanut butter. The train journey through Vietnam is particularly beautiful and we could see why people found it so difficult when the line was deliberately attacked and blown up during the war and resulting unrest. It has slowly but surely been patched up, mended and ‘reunified’ so travellers and locals are once more able to wind their way through the communities and endless fields of egrets and scarecrows which snake all the way along the coast from Ho Chi Minh to Hanoi. 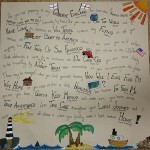 This entry was posted in Travel and tagged South East Asia, Train Travel, Vietnam. Bookmark the permalink.